Today, more than ever, the idea of being against authority has become mainstream. In fact, some would say that if you do not question authority, then you are part of a corrupt system seeking to oppress people. From schoolteachers to police officers to parents, rebelling against the authority of any of these is considered by some to be a fundamental right of citizens in a free society. At some point one has to wonder if rebelling against authority is ever justified. For this reason a Christian study on what does the Bible say about rebellion is in order. 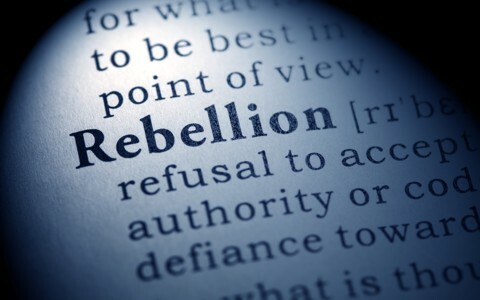 The word rebellion is commonly defined as (1): “An act of violent or open resistance to an established government or ruler; the action or process of resisting authority, control, or convention.” Synonyms of the word rebellion are defiance, disobedience, and subordination. Simply stated rebellion is the defiance or disobedience against authority. How does the Bible define rebellion? The Old Testament used the Hebrew word meri that translates to the English word rebellion. The root of this Hebrew word, mara, means to be or cause to be bitter or unpleasant. It is also translated most often as change, disobedient, disobey, provoke, rebellious, and rebel. In the New Testament, similar words for rebellion are disobedience and sedition, both of which refer to rebelling against or undermining authority. Interestingly, the Greek word for disobedience, comes from the same root for the word disbelief as described in an obstinate or rebellious way. What does the Bible say about rebellion against authority? What does the Bible say about rebellion? Although there is much more that can be said about rebellion, we have to understand that God is not the Author of confusion (1 Corinthian 14:26-33), He wants things to be done decently and in order (1 Corinthians 14:40). When we respect authority and exercise proper dominion, we can care for things the way God wants us to care for them. Doing this also models what God does for us, which sets the stage to protect and care for those who are most vulnerable in our society. Finally, when it comes to rebellion, we must realize that sometimes we may get a boss or someone over us that is not kind and loving. That does not change the fact that we respect and submit to their authority as long as we are not required to violate Scripture using Christ as our example. In the end, when we do what is right by God’s Word, it is pleasing to God and He will set things right when the time is right (Romans 12:14-21; 1 Peter 3:18-4:7). Rebellion against authority is common in our culture. Rebellion is the defiance or disobedience against authority. God has given man dominion over the earth, which requires authority and responsibility. When we rebel against authority, we rebel against the ordination of God; this angers God. Christ was our model of how to properly submit to authority. Dr Michael L has written 155 articles on What Christians Want To Know! Read them in the archive below. I need some prayers please. I’ve been going through some situations recently and have called on God. While sometimes I have failed him, I’ve repented and whenever I was in doubt he would show me he was still there. But latley I have been feeling a lack of caring on my part about listening; it’s as though my conscience has been altered. I know I am saved and that God forgives and loves always, but I’m a little scared honestly. I need God’s help and need his hand on me; I can’t handle these things alone. Please pray for me and for God to give me the will and courage to overcome my doubts and laziness and obey him. For God has not given us the spirit of fear; but of power, and of love, and of a sound mind. Please understand that satan wants to keep you in fear but I will pray that this spirit of fear in binded uo and removed in the MIGHTY NAME OF JESUS. our battle is never flesh and blood. You are with the Lord and the Lord has never forsaken you. Be strong in the faith of the Lord and in his might. 2 Timothy 2:1 You then, my son, be strong in the grace that is in Christ Jesus. < this is a COMMAND that paul gives us as disciples in the Lord and I will pray that, that fear is replaced with peace in Jesus name. 2 Timothy 2:1 ► You then, my son, be strong in the grace that is in Christ Jesus.< this is a command from our Lord. Lord strength peace and victory always be with you in Jesus name. Amen. Is the term”spirit of rebellion” biblical. What I mean is, are there spirits who’s purpose is to sow rebellion among people”? Can I pray against and rebuke a “spirit of rebellion”. Does the term”spirit of rebellion ” mean an actual spirit that sows rebellion? I mean can I pray against such a spirit or rebuke such a spirit, or is it just a term christians apply to rebellious people. Great question Sally. I believe it is not a spirit like a demon but just have the rebellious spirit as they did in Noah’s day when all they sought to do was evil continually (Gen 6), although we do know that the whole world, besides believers, are under the Devils sway who has blinded their minds to the things of God (2 Cor 4:3-4). It’s like saying a team as spirit…or that guys got spirit, so a spirit of rebellion is like having a tendency to rebel at human and God’s authority. Does this make sense my friend?